I promised you all pictures of the x-rays and my new titanium bling-on-the-inside, so here they are. 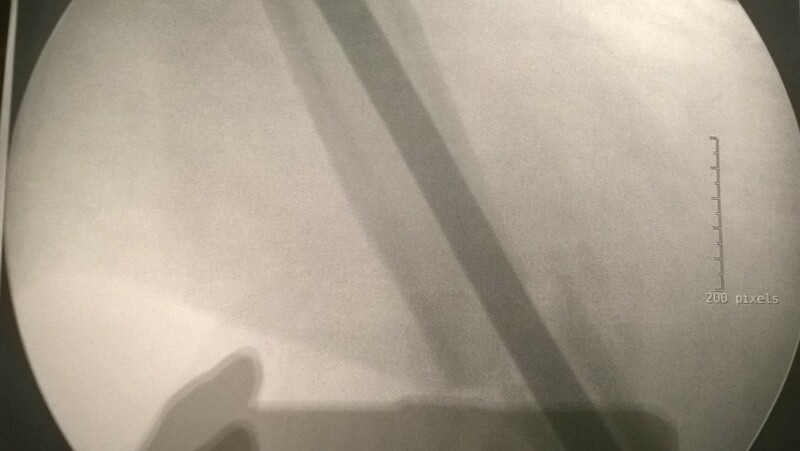 These are the x-rays after my surgery to fix my broken upper arm. Hopefully, Pilar will never run away again and forget to take me with her. Look at the pretty screws. 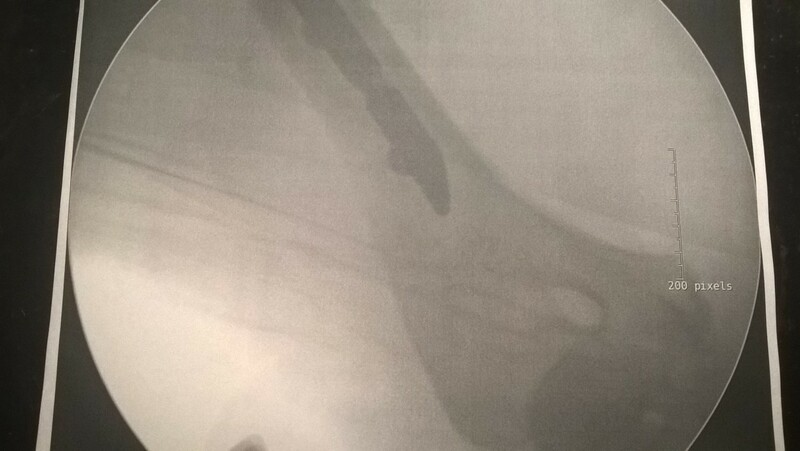 A titanium rod was inserted through the shoulder, into the marrow canal of the humerus bone. It is fixed in place by two screws at the top of the arm and two just above the elbow. 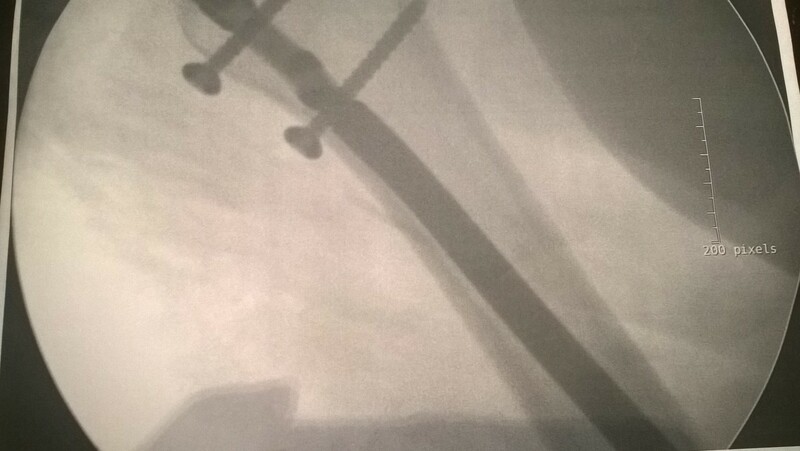 The lower half of the humerus bone, with the titanium rod inside. The upper end of the humerus bone. I think. I’m actually not sure which end of the bone this is. 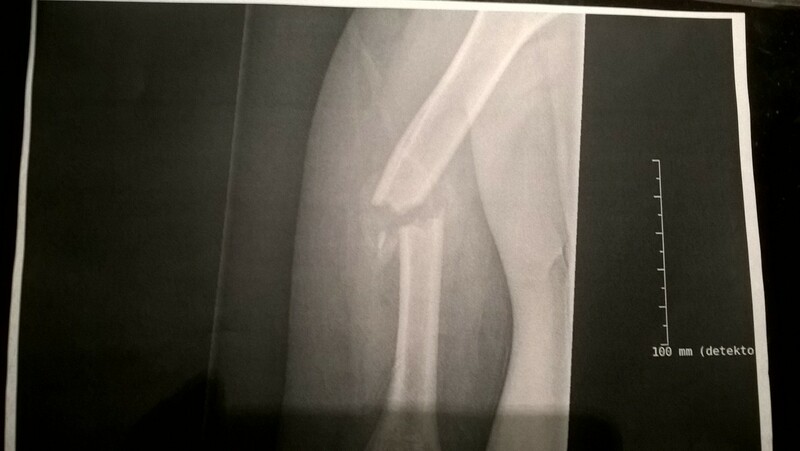 And just for the record, the x-ray from before surgery. You can easily see how the upper half of the bone is trying to make a run for it. I’m not going to lie. It hurt like bloody hell when it happened, and it hurt like bloody hell for the month I carried the arm around in a brace, hoping that it would heal the natural way. I was very relieved to have the surgery and while the pain block didn’t quite take, the pain has been far more easy to cope with after the needlework and the screws were in place. My arm gets stronger and more useful every day now, and in a few days I get to have the stitches out. I look forwards to that; turns out I’m slightly allergic to the glue on the bandaids. Have I learned anything from this? No, not really. I had my riding helmet on. A safety vest would not have protected me from falling on my arm. A bit would have made no difference since the first thing I did was letting go of the reins (a reflex from the good old days when my Arabian pony would try to pull me out of the saddle regularly). I guess I’ve learned that the barn is full of good people who will give a hand and a pat on the shoulder when required, and that Pilar is all right with being taken care of by other people for a bit. 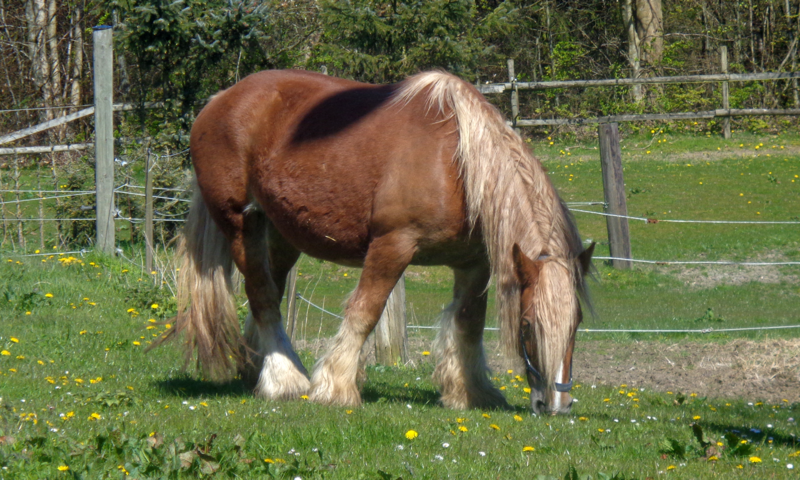 I’ve learned that even the most reliable and experienced horse can spook. Sometimes, manure just happens. With a bit of luck I should be back in the saddle by February. Next PostNext What Colour Is a Diva?